I have a couple of silver novelty buttoners that have retractable pencils incorporated. The pencil lead holder ends appear very similar in both and both have the same patent date stamped on them – OCT 8 78. So, presumably they are from the same manufacturer? Does anybody know who this is? 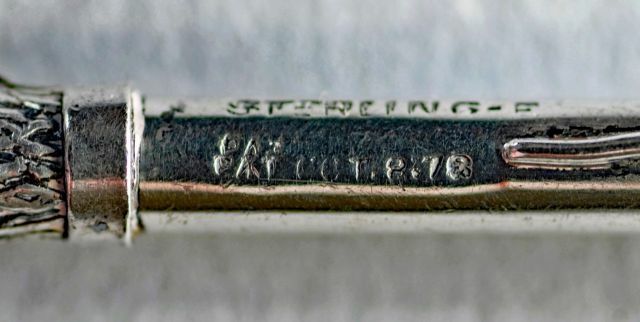 The riding crop is also stamped STERLING-F [or perhaps STERLING-E?] but with no maker’s mark. Crosby's 'Victorian Pencils, Tools to Jewels' shows the identical item also stamped 'GORHAM', but I understand that this probably indicates Gorham was the retailer of the item rather than the manufacturer. The fishing net has no marks other than the patent date. Thanks, Cheryl, for that info. I took a look in Rainwater and yes, I agree about LW Fairclough & Co being the probable maker of the riding crop. (Pity the patent did not cover the pencil mechanics!) Also I agree that patent 208858 nicely describes the fishing net buttoner end but does not really fit the riding crop. Could the date on the crop apply to another patent on the same day - or is that unlikely? Suppose it's possible, but do believe it's unlikely to be another patent, and feel that the overall shape of the loop, though asymmetrical, along with the twist, is similar enough to be covered under the patent. I did run though the 1878 patents for anything related to pencils, lead-holders, or Fairchild issued on that date and found none. They're both quite nice, enjoyed seeing them! I should have realised about the whip – my sister-in-law rides horses at her farm! Thanks again for your checks, Cheryl. I have seen a number of novelty silver items that have the same type of retractable pencil included in their design and recently found that you can still buy leads that fit them. If you have an item of this type, you should look for a lead diameter of 1.18 mm. The leads I came across were made by German companies and can be bought quite cheaply. Speaking of mechanical pencils, there is a wonderful book called The KB Collection of Pencils - Antique Mechanical Pencils that you may find of interest. Thanks June - I'll look out for a copy.